India is one of the world's youngest and most dynamic democracies and our democracy can only be effective when its citizens are aware, active and informed. Information on the roles of responsibilities of citizens is not readily accessible. Most citizens are at a loss as to how to vote, how to participate as active citizens in society, where to find answers to questions on civic matters and how to engage with elected representatives and neighborhood communities. 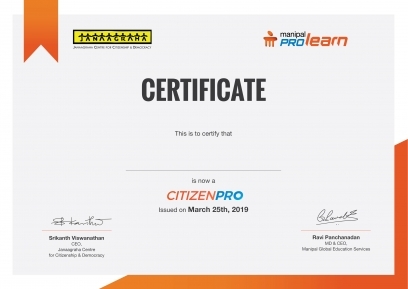 Manipal ProLearn has partnered with Janaagraha to create “CitizenPro”, a free online course to educate citizens on their role and the roles of government towards building active citizens. This course will help you understand how you can become an active citizen protecting and upholding your fundamental rights and duties. After taking this course we hope that you will make a transition from a citizen to CitizenPro. With Janaagraha since its inception 18 years ago, she currently heads the Civic Participation Program, she works with city governments and community groups across the country. Mathangi is an Associate member of the Institute of Chartered Accountants of India. She is currently working on municipal finance reforms projects in the States of Jharkhand and Karnataka, besides the 15th Finance Commission Recommendations. An active civic evangelist, she may be lauded as the co-founder of CfB, which initiated the famed Steel Flyover Beda movement in Bangalore and is equally committed to heritage as the founder of #HeritageBeku. Kuldeep has been part of many neighbourhood clean-up drives, setting up waste management systems and has won several accolades including being elected as Ashoka’s Lead Changemaker, MIT GSW Fellow, Ashoka Fellow, Unreasonable Fellow, and more. Naresh is well known for his long-term association with Venkataramanan Associates (an award-winning architectural firm) & is the founder of Imagine Bangalore. He is a regular advisor to government bodies & has fueled many progressive causes. Mohan is engaged in many social activities like black spot eradication, night patrolling, waste segregation awareness, plastic ban, community policing to name a few. Rajeev is an actor, director, writer, and advertising professional. He has directed a film that uses satire to oppose the elevated flyover in Bangalore& has been instrumental in the adoption of comprehensive waste management and composting. Vachana works in urban policy research and advocacy and has been working closely with governments to advocate systemic urban reforms in India. © 2019 Manipal ProLearn. All rights reserved.